After three prototypes and multiple tweaks to his robotic fish, Xiaobo Tan is planning to deploy the water-monitoring device this August. “Things have been going slower then what we expected, but we are making good progress overall,” said Tan, associate professor in the Department of Electrical and Computer Engineering at Michigan State University. Great Lakes Echo covered the early development stages of Tan’s robofish in 2009. His latest prototype can submerge, something the initial robofish couldn’t do. It is almost capable of transferring sensor signals in real time, another new development. The robofish submerges to sense water quality, but must surface to transmit signals to the base station or to other robofish. “So usually there is a 10 to 20 minute lagging time.” Tan said. 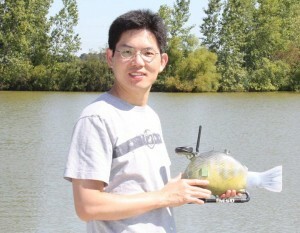 Xiaobo Tan, associate professor in the Department of Electrical and Computer Engineering at Michigan State University, with his robofish prototype. A big hurdle is keeping the prototype affordable. Tan hopes to fit each fish with sensors that monitor harmful algae blooms, oxygen levels, water temperature and pollutants. But the large size and high price of each sensor has made progress difficult. The sensors cost approximately $2,000 each. The fish itself costs around $2,500 without the sensors. Adding one almost doubles the overall cost. Meanwhile, the competition is heating up. “There are efforts all over the world trying to utilize some sort of fish like robot to monitor the environment.” Tan said. Scientists at the University of Essex recently deployed a robotic fish in Spain that does everything Tan’s fish does and then some. Finding small sensors was not an issue for their 5-ft.-long prototype, which costs $30,000 per fish. One thing can be said for sure, in a contest of which robofish looks most like a real fish, Tan’s design would easily win. Looks like a high dollar Muskie lure to me. Better put your name and address on it.